The Chinese spent a mere $43 billion dollars to put a big happy face on their image at the Olympic games. Of course, there is something slightly obscene in spending that kind of money when many of your citizens live in abject poverty and the victims of the recent earthquake still suffer in the streets. (Editor's note: $15 billion was spent by Greece on the Athens Olympics in 2004, and thousands of Chinese people were moved out of their homes to make way for the new state-of-the art stadiums.) The opening ceremonies were nothing short of spectacular and specifically designed to not only impress, but to give us a warm fuzzy feeling about the Chicoms. No one could disagree… amazing. While the world’s attention focused on the exploits of Mike Phelps and the “Redeem Team” and with President Bush in the stands as First Fan, Russia decided this would be an excellent time to invade Georgia. Bush in the early days of his administration had badly misjudged Putin, declaring that ‘I have looked into his heart and see a man that I can deal with…' or something like that). He should have looked into his eyes instead. Any businessman worth his salt would have gazed into those rattlesnake eyes and quickly concluded that they would trust this guy no further than they could throw a fully-loaded 737. Speaking of T. Boone... I suggested in a recent piece (“This an’ That”, August 6) that someone should look into the possible economic benefit ol’ T-bone might have from his expensive ad campaign touting wind farms and natural gas. Voila! On cue author and journalist Michelle Malkin did just that in a piece entitled “Nan and the Big Wind Boondoggle”, August 13). Turns out, Pickens is the founder and principal stockholder of a company called Clean Energy Fuels Corporation (stock symbol CLNE) that is heavily into natural gas. 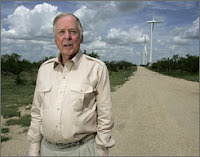 He also founded a company called Mesa Power that (surprise, surprise) builds wind farms. Mesa has invested some $12 billion in a wind farm development in the Texas Panhandle. T-bone admits that these wind farms cannot be economically viable without government subsidies, so it should stun no one that he enthusiastically supports a bill in California to provide $10 billion in state and federal funds for renewal energy resources. Think wind and natural gas.